An importer has to clear two different sorts of “taxes” when fully importing an aircraft into the EU – the customs duty (typically 2,7% for business jets) and the VAT (ranging between 17-27%). Both rates are calculated based on the value of the aircraft. The present preconditions for clearing the customs duty via an end-use arrangement is that the importing entity must be fully established in the EU and have actual and legal right to dispose of the aircraft. These preconditions have apparently been too difficult to administrate, and the EU is now changing the regulation for the customs duty part as described below. The change will be in force per January 2018. A civil aircraft can be imported for free circulation with relief from customs duties if the aircraft has been duly entered on a register of a Member State or a third country in accordance with the Convention on International Civil Aviation dated 7. December 1944 (ICAO). Importation with customs relief pr. 1 January 2018 is no longer conditioned upon applying for end-use procedure. Importation of civil aircraft can be made under customs relief by reference to the valid certificate of registration in the customs declaration for release for free circulation. Please note that the presence of the relevant certificate on board of each aircraft is mandatory. See the EU implementing regulation here. The 2018 change will be welcomed by most as the 2015/16 change was complicated and hard to understand. It is a bit shocking that the two EU OXFAM tax haven states, the Isle of Man and the Netherlands, actually never implemented the “old” 2016 UCC rules requiring a real establishment and compliance to the disposal rules described in the EU working paper from the EU Customs Code Committee. Both member states allowed a local nominee to import an aircraft based on “empty” disposal agreements and/or ignored the demand for correct real establishment as mentioned in the UCC. It is unclear whether or not the EU Commission is aware of and will pursue this. The practice is not legal in our opinion. Importers using full importation must consider how to handle the VAT part, as this amount is by far the biggest amount imposed during the importation and there are many pitfalls. The aircraft must be used 100% for accepted VATable economic activities. The aircraft must be used 100% for business purposes, the term predominately used for business is not accepted unless handled correctly (see more info here). Only the real aircraft owner can import and reclaim the VAT (see more info here). If importer is an accepted VAT-exempt international airline, there may be limitations for non-commercial use of the aircraft (see more info here). Please be aware that the above points and many other rules are often interpreted differently in the 28 EU member states and that these interpretations can change without any long notice. The customs duty is now much easier to handle but an importer must still be aware of the above-mentioned issues regarding the VAT. Analyse your usage of the aircraft and eventually consult your local VAT adviser for a verification of the exact usage. A non-EU based entity can now use full importation without risking jeopardizing the demand for correct EU-establishment etc, but full importation still includes a lot of potential VAT/tax-liability and which typically requires 5 years of correct economic activity and 7 years of record-keeping. All these factors are eliminated by using Temporary Admission, and most non-EU operators will in fact have the same flying privileges as under full importation. 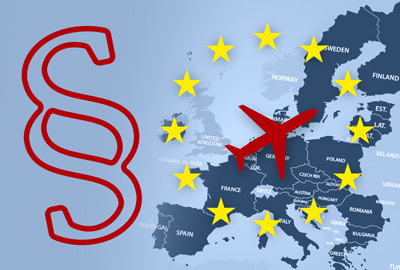 The few limitations do not influence the typical corporate flight and will give the declarant more flexibility and extra advantages, such as unrestricted personal/family/guest use, also for EU-resident passengers. Our advice has always been to ask the local tax authorities for a binding advance tax ruling prior to any importation/admission in order to eliminate any doubt about the outcome. All cases are different in the details, and a binding advance tax ruling will also take into account all new European Court of Justice judgements! Even if you think you have a fully working set-up, it is too risky to go through with the importation/ admission without a binding advance tax ruling from the EU member state into which the aircraft is to be imported. This update relates only to a full importation into the EU where the aircraft is exempt as being used for commercial flights with an AOC/Charter certificate or where the aircraft is used 100% for business purposes and the import VAT has been reclaimed. It does not apply to Temporary Admission.